With the NBA Finals coming up in the next several days, I thought I would indulge in a bit of NBA nostalgia..I've been an NBA fan since the 1968-69 season when I listened to many of the Cincinnati Royals games on WLW-700 in Cincinnati. 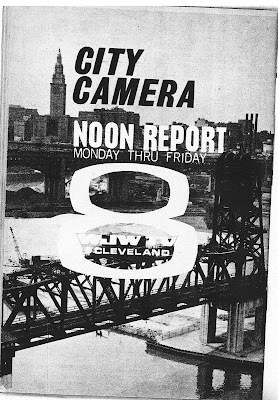 When the Cleveland Cavaliers came in the league in 1970-71 I listened to them on the old WCUE-FM 96.5 (Now WAKS)..WERE 1300, the Cavaliers flagship station for the first 2 Cavs seasons..was and is now unable to be heard in Canton..WEWS Channel 5 carried Cavaliers games from 1970-73.. This clip is from the Chicago-Golden State Western Conference Final Game 7 May 14, 1975. Brent Musberger and Oscar Robertson are the announcers..The main attraction of this clip is the intro theme..very catchy.. Lyrics to "NBA on CBS"
The time is now, the name of the game is action. Come on, and join the roar of the crowd"
When you watch the N-B-A on C-B-S. When the NBA moved from ABC to CBS after the 1972-73 season it didnt seem right to me..The NBA BELONGED on ABC..Of course, fans got used to the NBA on CBS over time and these days it doesnt matter.. 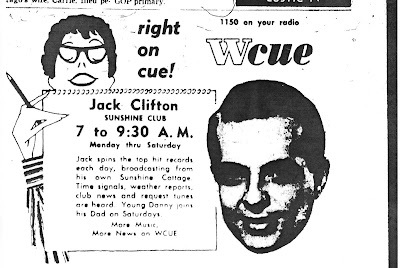 Thanks to jkygogo for originally posting the clip..
Akron Beacon Journal Ad for the "Jack Clifton Sunshine Club" on WCUE-AM 1150 Monday through Saturday...(1956)..WCUE was ultimately given away to Family Stations of Oakland, California, who have run a Satellite-fed conservative religious format since November 1986.."Family Radio"
Set of various sign-on's, sign-offs and jingles from KYW AM/FM from around 1956-into the late 1950's era..
4. KYW-FM sign-on (12 Noon!) "Your Fine Arts Station"
9. KYW Promo-Karl Bates "Is Your Radio Sluggish lately?" 10. KYW AM/FM sign-off with Bill Mayer promo..
Usually best to play these back to back-If You click on any one..The next will automatically play..Still experimenting with this audio stuff..Thanks to Jerry Immel for providing these. 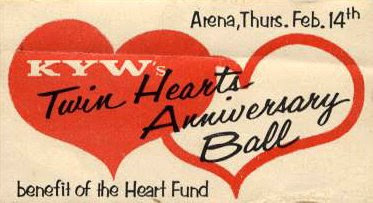 Today I want to give a good look at radio in the mid-1950's..KYW-AM/FM seemed to be a mixture of big band, jazz and classsical music along with some NBC Drama/Comedy shows...The last days of Old Time Radio were upon us and radio was changing more into music and news intensive programmming..Between the Akron Beacon Journal and the Canton Repository, I want to share the Radio Schedules of one particular day..
12:30 Carol's Notebook-Various Ladies portrayed "Carol Adams"..Sort of a "Women's Editor"
I hope to do the Stan Anderson/Cleveland Press article next about KYW..This post sort of got bigger than I figured..
TV Guide Ad for a Sunday, February 19th, 1956 CBS/TV 8 showing of "The Honest Man" starring Jack Benny and Zsa Zsa Gabor on GE Theater with Ronald Reagan..Incidentally, this program is currently part of a 40-show Jack Benny DVD set from Mill Creek Entertainment. 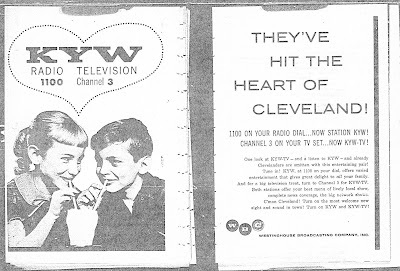 KYW-TV 3 sign-off by Gordon Ward from 1956..Not long after the move from Philadelphia..Notice the Catchy Jingle just before the sign-off..KYW was at 815 Superior Avenue at this time..The sign-off was probably on a Saturday night-Sunday Morning. 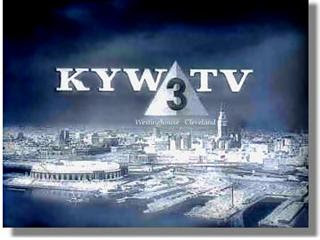 While this is now on the Internet Archive, I'd like to thank Jerry Immel of Atlanta for sharing this clip..He has many others which I'd like to introduce over time..Just click on the player to listen..
WTAM and WNBK will officially become KYW and KYW-TV at 11:55 AM tomorrow (2-13-56) as the new owners, Westinghouse Broadcasting Co., shake up the programming lineup but continue to carry NBC radio and television shows. A New farm show will be presented Mondays through Saturdays from 5:30-6 AM. Bill Mayer, the Morning Disk Jockey will be heard from 6-9:30 AM six days a week. "Mildred and Gloria", a woman's program, will be heard daily from 9:30 to 10:15 AM with NBC's "Weekday" following Mildred Funnell and Gloria Brown. Mayer will Emcee an Afternoon musical program and Joe Mulvihill will spin platters from 5 to 7:30 PM. "Night Music" will be heard from 10:15 to 1 each evening. The first 75 minutes will stress semi-classical and operetta music. from 11:30 on there will be concert pieces and heavier classics..
Dr. Bergen Evans, author and lecturer, will deliver a series of spoken essays "Of Many Things" Sundays at 6:15 PM starting next week, and Dr. Helen Parkhurst, child psychologist, will present a recorded series on juvenile delinquency and child development problems Sundays at 7 PM. Tom Haley will Emcee "Morning Surprise" daily at 9 (AM) There will be remote telecssts from spots around Cleveland, interviews, and news. "The Big R," a series of live and filmed programs discussing the national education problem and Cleveland in particular, will be seen Saturdays at 2:30 PM. "Juvenile Justice" a "live" show in which guest judges hold simulated court trials for Juvenile offenders will be seen Sundays at 10:30 AM..
9PM Academy Award Nominations for 1955. 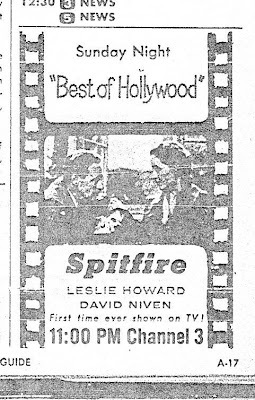 11:30 Movie-Dreams Never Lie-Actually a Drama Anthology episode-"Revlon Mirror Theater"-Listed as a "Movie"
Next:Stan Anderson's Cleveland Press Article, Radio Schedules of the time from Cleveland/Akron/Canton, Very rare KYW-1100 Audio from the period.. Here is a repost of a YouTube video from a few weeks back,,Featuring Chuck Schodowski and Ernie Anderson on the final aired episode of "Parma Place" in 1966. This was done on the WJW-TV 8 "Ghoulardi" show weeks before Anderson headed for Hollywood and his ABC-TV voiceover career..Chuck and Bob "Hoolihan" Wells would take over the Ghoulardi time slot in December, 1966..It was said by some that Hoolihan and Big Chuck lost the "edge" that Ghoulardi had and "played it too safe" in their skits. 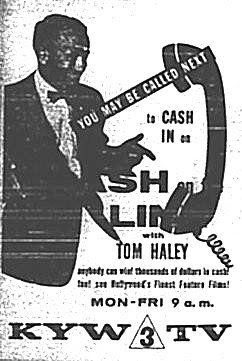 I contend that the show eventually had to have a different texture or it would never have lasted as long as it did..Thanks to bigchuckandliljohn.com for posting this gem..
A Fresh look..and a new link..
From November 1957..Ad for Tom Haley's Cash On The Line Movie slot..This was actually one of the first changes Westinghouse made when acquiring WNBK/KYW..The movie show began as "Morning Surprise" ..Apparently changing its name to "Cash on the Line" later on..Tom Haley was the longest running air personality at any one station in Cleveland History..Starting at WNBK-4 in 1948 and ending at WKYC-3 in 1997..49 years! I apologize for the quality of the picture..Sometimes the microfilm goes dark when it prints..But I felt this was too important not to include..
UPDATE: Thanks to a friend of mine from bigchuckandliljohn.com, "Hugo Sleestak" for inverting the picture for me and making it look a bit better..It is much appreciated.. I would like to introduce everyone to yet another new link..The Broadcast Pioneers of Philadelphia have been around since 1962..An association of current and former Philadelphia Radio and TV Broadcasters banding together to preserve Broadcast History in the Philadelphia area..One of their leaders, Gerry Wilkinson, was kind enough to allow me to use a Vintage KYW-TV slide to illustrate the post below about KYW's early days in Cleveland. Their website is a treasure trove of Vintage audio, video and photis from the History of Broadcasting in what is called "The Delaware Valley"..I have enjoyed their site for years and I'm sure you all will too.. Also..I thought I'd freshen up the blog with a new look..Please let me know if you like it..or not..Besides the cosmetic changes, links are now on the left of the page..Have a great day everyone..
From Jerry Immel:KYW-Radio Transcription Disc Label..
"WBC" Ad touting how perfect KYW and Cleveland would be for each other..From the same TV Guide as the other ad below..
Ad/Article from TV Guide the week of Feb.11, 1956 on the occassion of WNBK's call letter change to KYW-TV. Courtesy Atlanta area voiceover artist Jerry Immel. 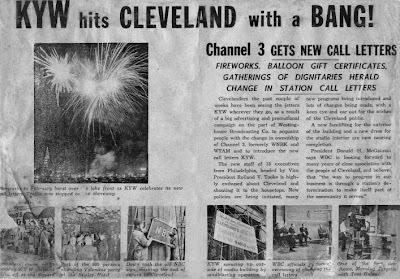 Our first posting in a while will highlight the NBC/Westinghouse swap of 1956-WPTZ-TV-AM to Cleveland (adding FM in the process)(with 3,000,000 dollars) and WNBK-AM-TV to Philadelphia(As WRCV). 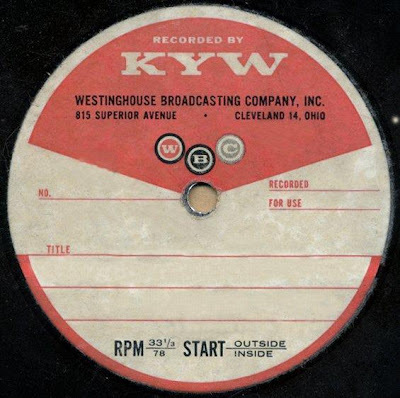 WPTZ had been bought in 1952 by Westinghouse from Philco Corp...To preserve the KYW Call Letters, then on their AM station at 1060 khz..They transferred them to Cleveland as KYW-TV 3, KYW-AM 1100 and KYW-FM 105.7..KYW had been in Chicago from 1921-34 before moving to Philadelphia..below are TV Guide listings:WNBK's final full day In Cleveland... and the first day of KYW-TV.